The main job of a Retail Sales Specialist is to provide excellent customer service and sell the products and services on behalf of the company. To accomplish this task, these specialists take responsibility of various tasks such as selling products to customers and explaining the details of the product, demonstrating the products, process sales transactions, handling customer payments, ensuring completion of paperwork such as warranties, financing and contracts; resolving issues, refilling stocks, overseeing sales team, assisting other departments, and winding up sales successfully. 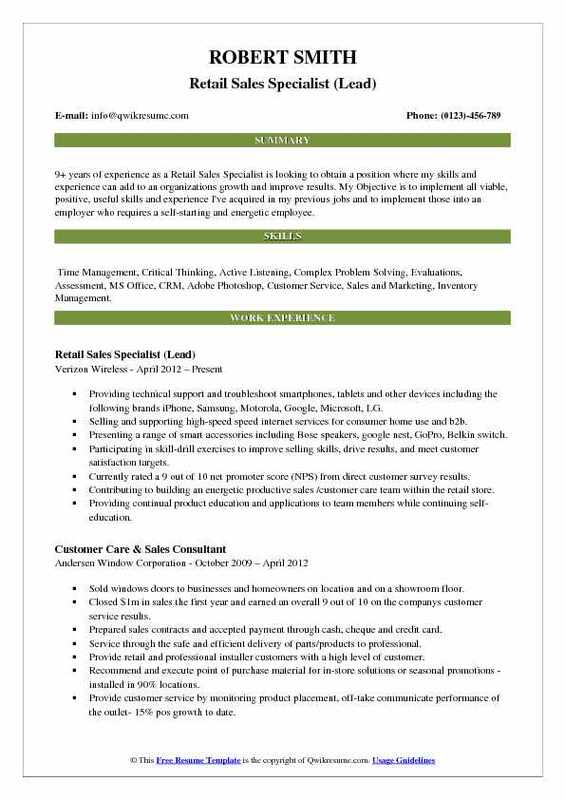 A well-written Retail Sales Specialist Resume emphasizes skills such as – proficiency and knowledge of the product, ability to maintain cleanliness and standards, the physical ability to walk or move around the sales floor, the potential to lift heavy objects, scheduling flexibility, ability to communicate and computer competencies. Education requirement for this post includes a high school diploma or a post-secondary degree. 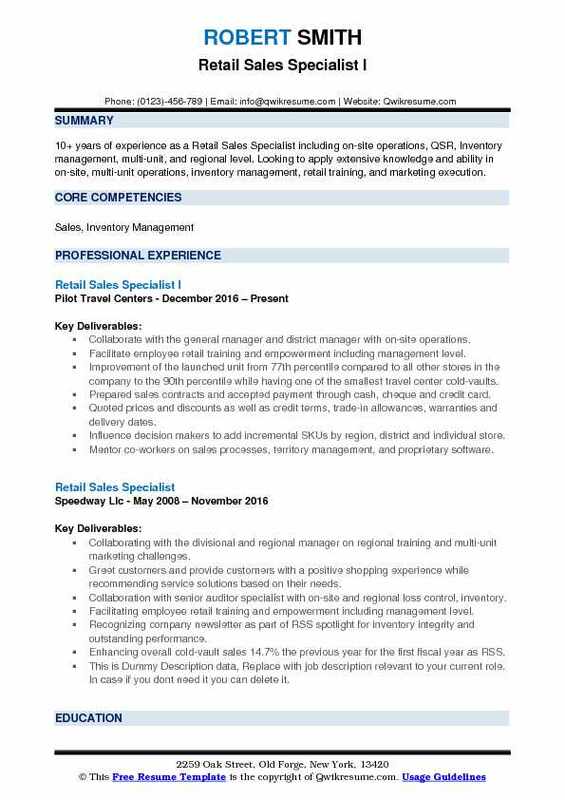 Summary : Motivated territory manager and sales/training specialist with a background in retail management and over 8 years of experience in driving sales on key national accounts is presently seeking a new position with a reputable company that will offer opportunities for continued career growth. 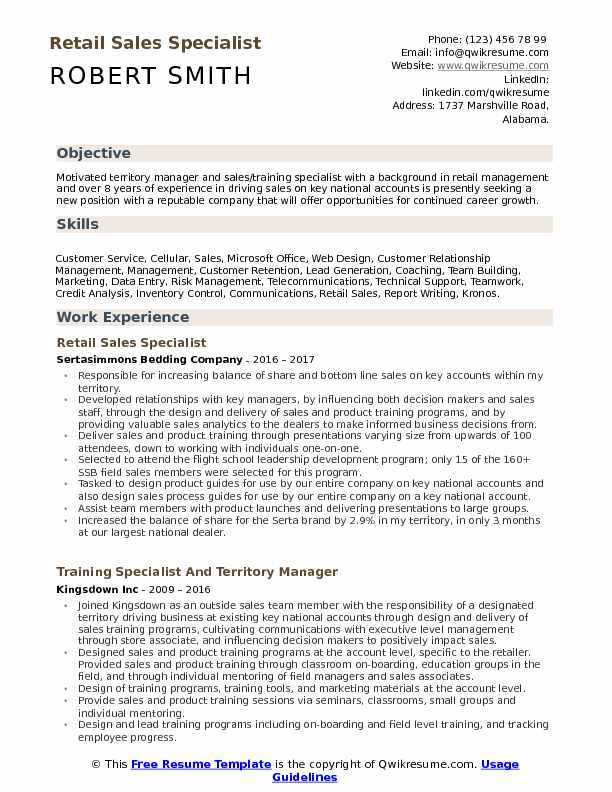 Skills : Customer Service, Cellular, Sales, Microsoft Office, Web Design, Customer Relationship Management, Management, Customer Retention, Lead Generation, Coaching, Team Building, Marketing, Data Entry, Risk Management, Telecommunications, Technical Support, Teamwork, Credit Analysis, Inventory Control, Communications, Retail Sales, Report Writing, Kronos. Responsible for increasing balance of share and bottom line sales on key accounts within my territory. Developed relationships with key managers, by influencing both decision makers and sales staff, through the design and delivery of sales and product training programs, and by providing valuable sales analytics to the dealers to make informed business decisions from. Deliver sales and product training through presentations varying size from upwards of 100 attendees, down to working with individuals one-on-one. Selected to attend the flight school leadership development program; only 15 of the 160+ SSB field sales members were selected for this program. Tasked to design product guides for use by our entire company on key national accounts and also design sales process guides for use by our entire company on a key national account. Assist team members with product launches and delivering presentations to large groups. Increased the balance of share for the Serta brand by 2.9% in my territory, in only 3 months at our largest national dealer. Drive bottom line sales on a key national account with responsibility for wholesale sales in excess of $15m annually. Prepare and present a monthly business review to my dealers regional vice president, district managers, and area managers. Develop a personal action plans to increase business in, and to overall manage my territory. 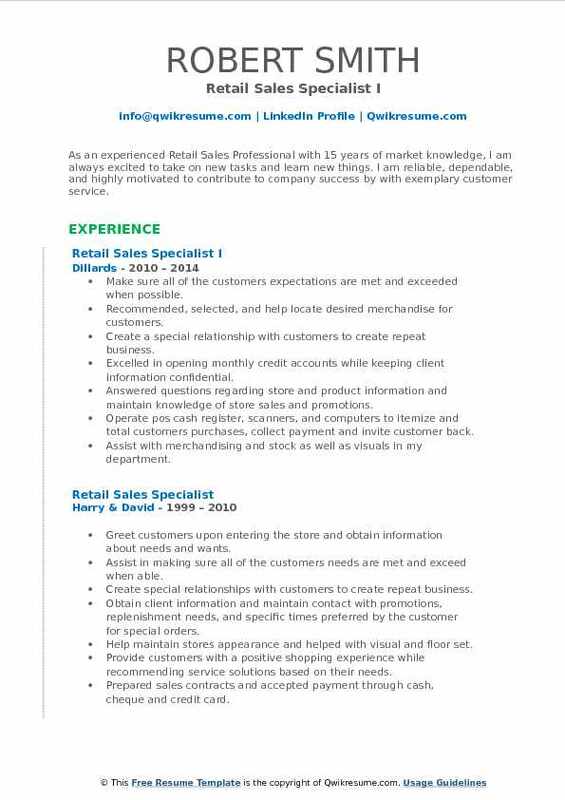 Summary : 10+ years of experience as a Retail Sales Specialist including on-site operations, QSR, Inventory management, multi-unit, and regional level. Looking to apply extensive knowledge and ability in on-site, multi-unit operations, inventory management, retail training, and marketing execution. Collaborate with the general manager and district manager with on-site operations. Facilitate employee retail training and empowerment including management level. Improvement of the launched unit from 77th percentile compared to all other stores in the company to the 90th percentile while having one of the smallest travel center cold-vaults. Prepared sales contracts and accepted payment through cash, cheque and credit card. Quoted prices and discounts as well as credit terms, trade-in allowances, warranties and delivery dates. Influence decision makers to add incremental SKUs by region, district and individual store. Mentor co-workers on sales processes, territory management, and proprietary software. 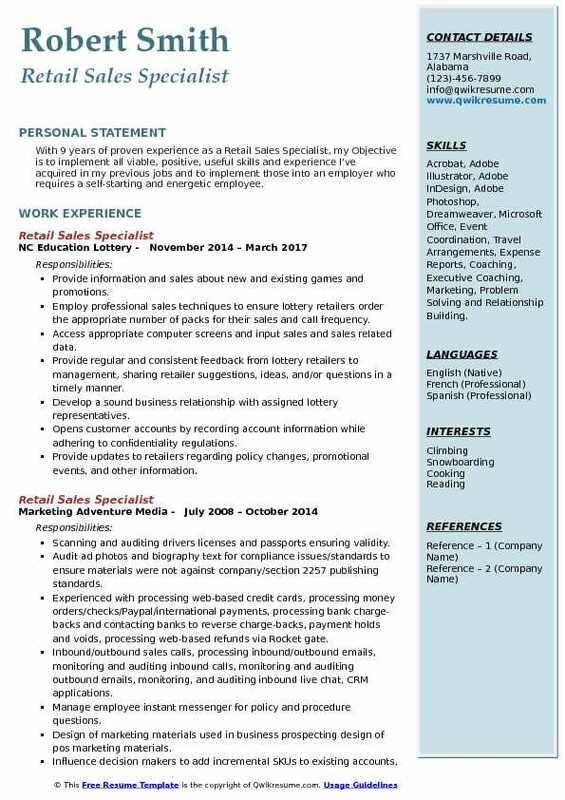 Summary : 9+ years of experience as a Retail Sales Specialist is looking to obtain a position where my skills and experience can add to an organizations growth and improve results. My Objective is to implement all viable, positive, useful skills and experience I've acquired in my previous jobs and to implement those into an employer who requires a self-starting and energetic employee. Skills : Time Management, Critical Thinking, Active Listening, Complex Problem Solving, Evaluations, Assessment, MS Office, CRM, Adobe Photoshop, Customer Service, Sales and Marketing, Inventory Management. Providing technical support and troubleshoot smartphones, tablets and other devices including the following brands: iPhone, Samsung, Motorola, Google, Microsoft, LG. Selling and supporting high-speed speed internet services for consumer home use and b2b. Presenting a range of smart accessories including Bose speakers, google nest, GoPro, Belkin switch. Participating in skill-drill exercises to improve selling skills, drive results, and meet customer satisfaction targets. Currently rated a 9 out of 10 net promoter score (NPS) from direct customer survey results. Contributing to building an energetic productive sales /customer care team within the retail store. Providing continual product education and applications to team members while continuing self-education. Maintaining focus while troubleshooting and solving technical issues in order to prevent escalations. Conveying technical information, product features/capabilities to customers verbally and written. Summary : As an experienced Retail Sales Professional with 15 years of market knowledge, I am always excited to take on new tasks and learn new things. I am reliable, dependable, and highly motivated to contribute to company success by with exemplary customer service. Skills : Time efficient, Creative problem solver, Team player, Listening skills, Productive and efficient, Excellent communication skills, Fast learner Cash handling accuracy, Courteous demeanor, Work well with co-workers and Strong client relations. Make sure all of the customers' expectations are met and exceeded when possible. Recommended, selected, and help locate desired merchandise for customers. Create a special relationship with customers to create repeat business. Excelled in opening monthly credit accounts while keeping client information confidential. Answered questions regarding store and product information and maintain knowledge of store sales and promotions. Operate pos cash register, scanners, and computers to itemize and total customers purchases, collect payment and invite customer back. Assist with merchandising and stock as well as visuals in my department. Make sure the customers' experience is above expectations by offering 5-star service. 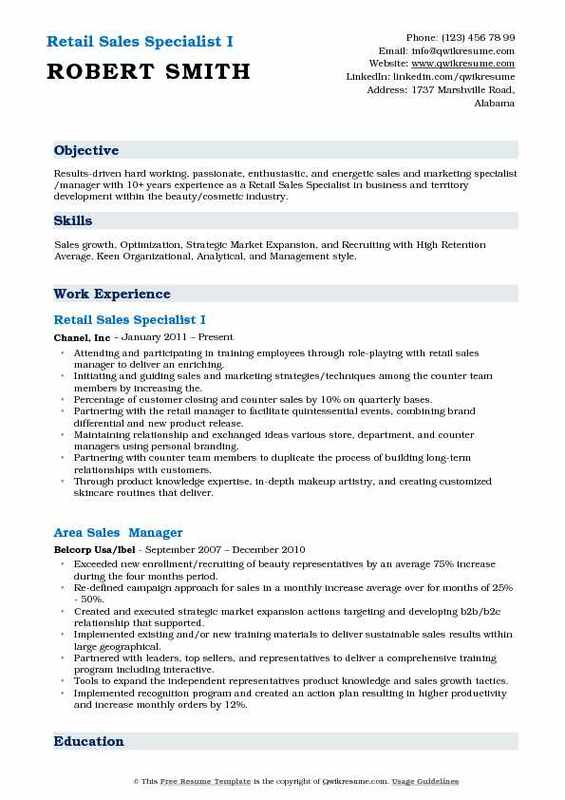 Summary : With 9 years of proven experience as a Retail Sales Specialist, my Objective is to implement all viable, positive, useful skills and experience I've acquired in my previous jobs and to implement those into an employer who requires a self-starting and energetic employee. Skills : Acrobat, Adobe Illustrator, Adobe InDesign, Adobe Photoshop, Dreamweaver, Microsoft Office, Event Coordination, Travel Arrangements, Expense Reports, Coaching, Executive Coaching, Marketing, Problem Solving and Relationship Building. Provide information and sales about new and existing games and promotions. Employ professional sales techniques to ensure lottery retailers order the appropriate number of packs for their sales and call frequency. Access appropriate computer screens and input sales and sales related data. Provide regular and consistent feedback from lottery retailers to management, sharing retailer suggestions, ideas, and/or questions in a timely manner. Develop a sound business relationship with assigned lottery representatives. Opens customer accounts by recording account information while adhering to confidentiality regulations. Provide updates to retailers regarding policy changes, promotional events, and other information. Summary : Results-driven hard working, passionate, enthusiastic, and energetic sales and marketing specialist /manager with 10+ years experience as a Retail Sales Specialist in business and territory development within the beauty/cosmetic industry. 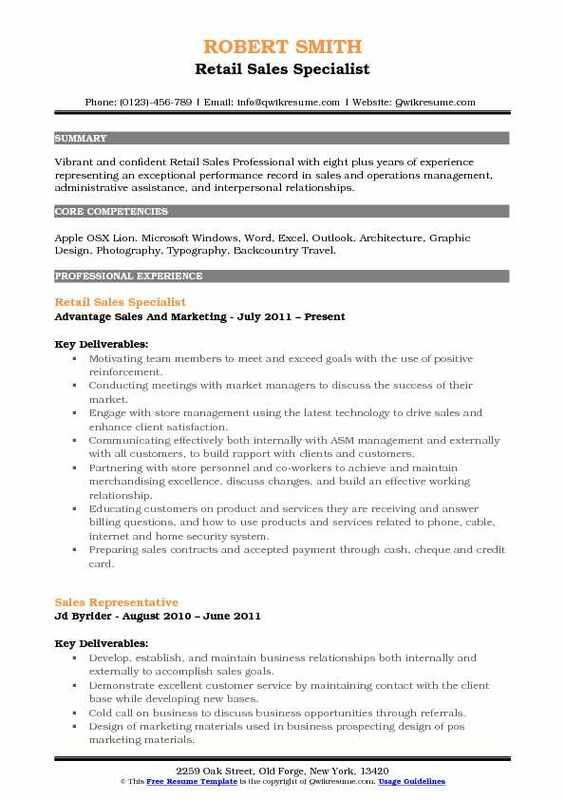 Skills : Sales growth, Optimization, Strategic Market Expansion, and Recruiting with High Retention Average. Keen Organizational, Analytical, and Management style. Attending and participating in training employees through role-playing with retail sales manager to deliver an enriching. Initiating and guiding sales and marketing strategies/techniques among the counter team members by increasing the. Percentage of customer closing and counter sales by 10% on quarterly bases. Partnering with the retail manager to facilitate quintessential events, combining brand differential and new product release. Maintaining relationship and exchanged ideas various store, department, and counter managers using personal branding. Partnering with counter team members to duplicate the process of building long-term relationships with customers. Through product knowledge expertise, in-depth makeup artistry, and creating customized skincare routines that deliver. 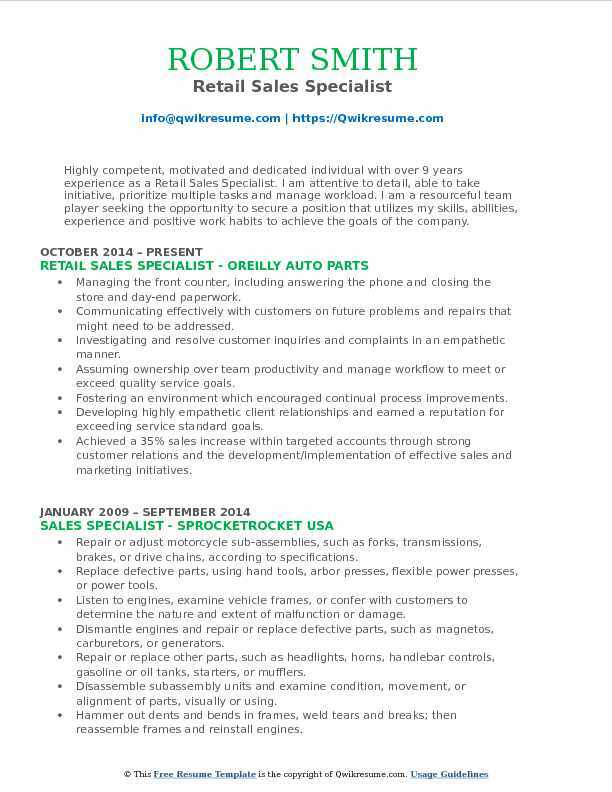 Summary : Highly competent, motivated and dedicated individual with over 9 years experience as a Retail Sales Specialist. I am attentive to detail, able to take initiative, prioritize multiple tasks and manage workload. I am a resourceful team player seeking the opportunity to secure a position that utilizes my skills, abilities, experience and positive work habits to achieve the goals of the company. Skills : Diagnostics Knowledge, Trusted Key Holder, Fuel Ignition Repair, Creative Problem Solver, Air Conditioning Systems, Exceptional Communication, Heavy Equipment Operation, Quick Learner, Exhaust Systems, and Training Development Aptitude. Managing the front counter, including answering the phone and closing the store and day-end paperwork. Communicating effectively with customers on future problems and repairs that might need to be addressed. Investigating and resolve customer inquiries and complaints in an empathetic manner. Assuming ownership over team productivity and manage workflow to meet or exceed quality service goals. Fostering an environment which encouraged continual process improvements. Developing highly empathetic client relationships and earned a reputation for exceeding service standard goals. Achieved a 35% sales increase within targeted accounts through strong customer relations and the development/implementation of effective sales and marketing initiatives. Summary : Vibrant and confident Retail Sales Professional with eight plus years of experience representing an exceptional performance record in sales and operations management, administrative assistance, and interpersonal relationships. Skills : Apple OSX Lion. Microsoft Windows, Word, Excel, Outlook. Architecture, Graphic Design, Photography, Typography, Backcountry Travel. Motivating team members to meet and exceed goals with the use of positive reinforcement. Conducting meetings with market managers to discuss the success of their market. Engage with store management using the latest technology to drive sales and enhance client satisfaction. Communicating effectively both internally with ASM management and externally with all customers, to build rapport with clients and customers. Partnering with store personnel and co-workers to achieve and maintain merchandising excellence, discuss changes, and build an effective working relationship. Educating customers on product and services they are receiving and answer billing questions, and how to use products and services related to phone, cable, internet and home security system. Preparing sales contracts and accepted payment through cash, cheque and credit card. 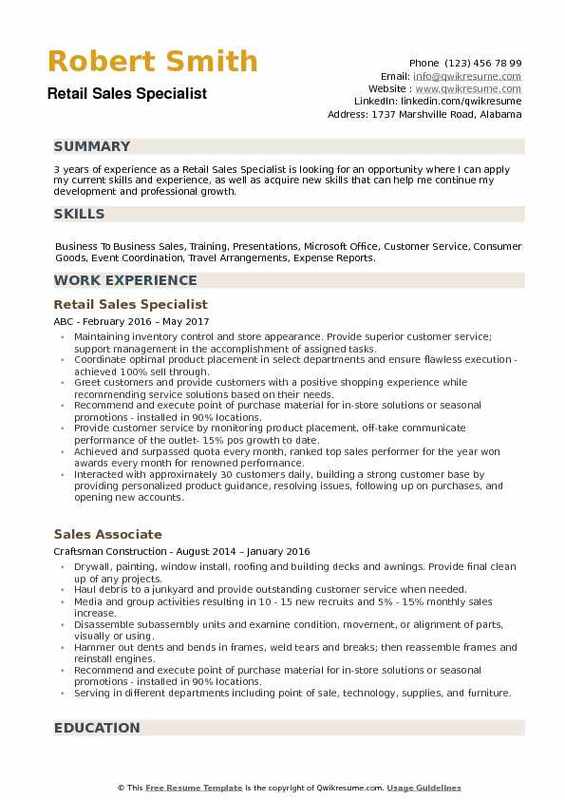 Headline : With 7 years of experience as a Retail Sales Specialist, looking to obtain a position with a growing company that will allow me to grow as an individual, as well as challenge me to reach my full potential. 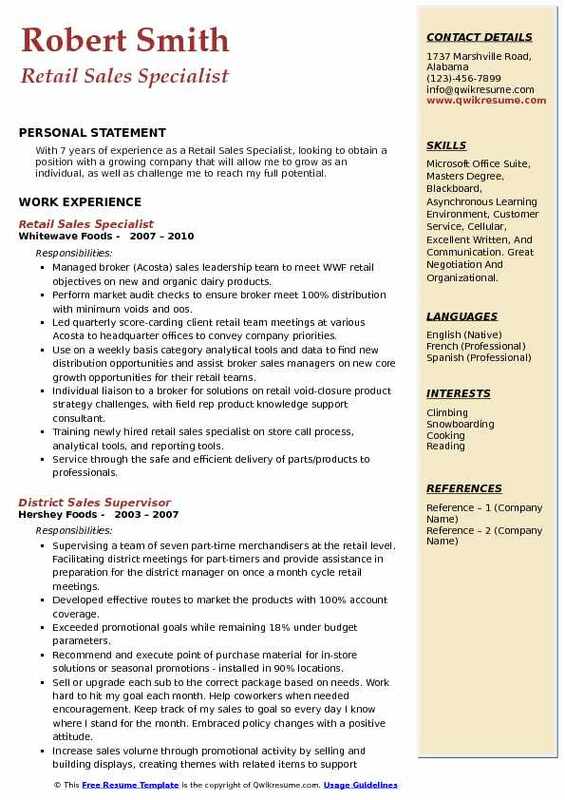 Skills : Microsoft Office Suite, Masters Degree, Blackboard, Asynchronous Learning Environment, Customer Service, Cellular, Excellent Written, And Communication. Great Negotiation And Organizational. Managed broker (Acosta) sales leadership team to meet WWF retail objectives on new and organic dairy products. Perform market audit checks to ensure broker meet 100% distribution with minimum voids and oos. Led quarterly score-carding client retail team meetings at various Acosta to headquarter offices to convey company priorities. Use on a weekly basis category analytical tools and data to find new distribution opportunities and assist broker sales managers on new core growth opportunities for their retail teams. Individual liaison to a broker for solutions on retail void-closure product strategy challenges, with field rep product knowledge support consultant. Training newly hired retail sales specialist on store call process, analytical tools, and reporting tools. Service through the safe and efficient delivery of parts/products to professionals. Provide retail and professional installer customers with a high level of customer experience. Objective : 3 years of experience as a Retail Sales Specialist is looking for an opportunity where I can apply my current skills and experience, as well as acquire new skills that can help me continue my development and professional growth. Skills : Business To Business Sales, Training, Presentations, Microsoft Office, Customer Service, Consumer Goods, Event Coordination, Travel Arrangements, Expense Reports. Maintaining inventory control and store appearance. Provide superior customer service; support management in the accomplishment of assigned tasks. Coordinate optimal product placement in select departments and ensure flawless execution - achieved 100% sell through. Greet customers and provide customers with a positive shopping experience while recommending service solutions based on their needs. Recommend and execute point of purchase material for in-store solutions or seasonal promotions - installed in 90% locations. Provide customer service by monitoring product placement, off-take communicate performance of the outlet- 15% pos growth to date. Achieved and surpassed quota every month, ranked top sales performer for the year won awards every month for renowned performance. Interacted with approximately 30 customers daily, building a strong customer base by providing personalized product guidance, resolving issues, following up on purchases, and opening new accounts.